Swing Shift Shuffle: Rock-Em Sock-Em Robots! From 1933! 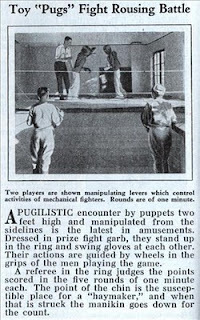 "Rock-Em Sock-Em Robots" first appeared in the mid-1960's, and the classic game/toy is still available today. This 1933 issue of Modern Mechanix, however, demonstrates that somebody had the same idea thirty years earlier. Toy "Pugs" Fight Rousing Battle.